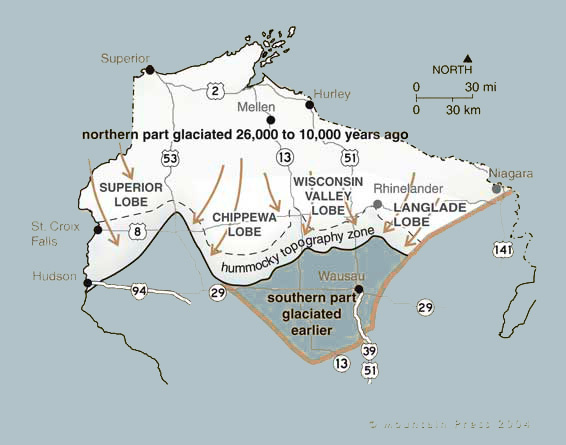 The maximum extent of the Chippewa, Wisconsin Valley, and Langlade Lobes of the Laurentide Ice Sheet in north-central Wisconsin is clearly marked in most places by narrow, sharp-crested ridges called moraines and a broad (up to 6 miles wide) band of uneven, knobby topography that is termed hummocky. This hummocky area consists of many poorly drained, bowl-shaped depressions, called kettles, which commonly contain wetlands or lakes. Blocks of ice that became detached from the margin of the glacier were buried by sediment, consisting primarily of sand, silt, and clay. Later melting of the ice blocks resulted in the uneven collapse of the overlying sediment and the formation of the kettles. The margin of the three ice lobes is easily seen in Langlade, Lincoln, and Taylor Counties. The hilly, rock-strewn landscape of this glaciated area is noticeably different from the rolling topography of the area to the south. As a result, the glacial boundary here is also a boundary between good farmland to the south and the forest to the north.